The task of designing an appliance showroom to be an inviting and functional space was an exciting challenge for the designers of Architectural Justice. 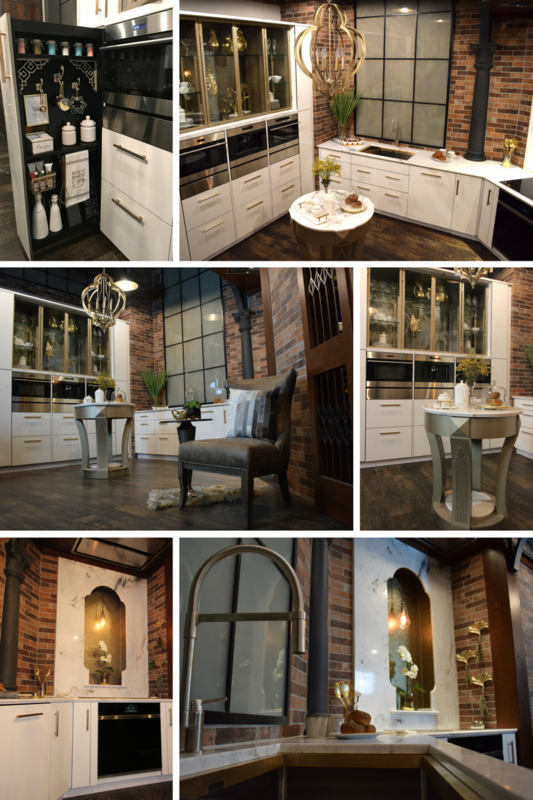 Each vignette displays the newest lines from Sub-Zero, Wolf, Asko and Best products. 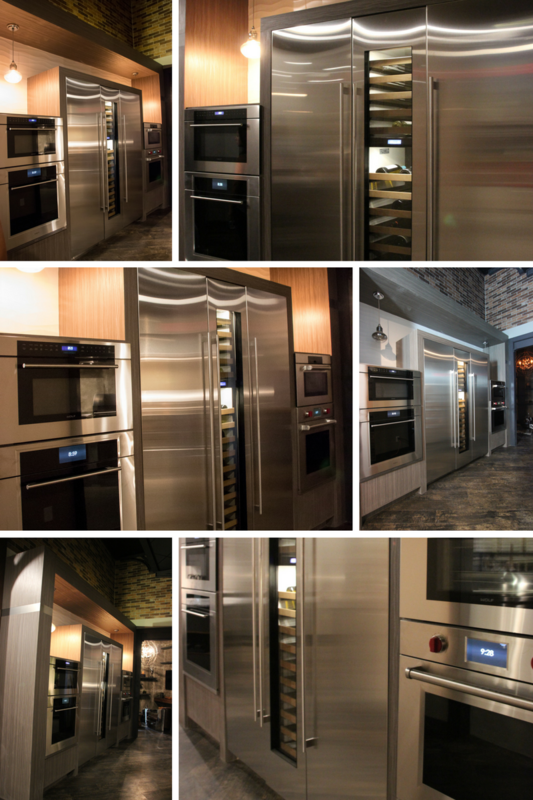 Hand-crafted appliance panels including reclaimed wood, glass and metal were used in a pioneering fashion to disguise the Integrated appliances, illustrating to consumers that even a refrigerator or dishwasher can be stylish. 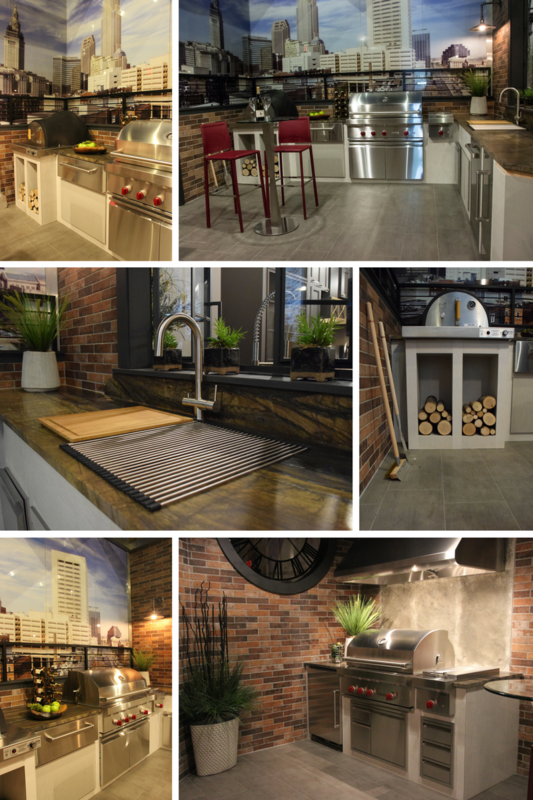 The Modern Industrial Kitchen features custom metal, glass and wood integrated appliance panels which are complimented with Foundry Grey painted cabinetry. Custom drawer organizers seamlessly hold utensils, dishes, and cookware. The handcrafted reclaimed wood island is a true statement piece. The wood pairs beautifully with Calacatta White Quartzite countertops displaying a waterfall edge. 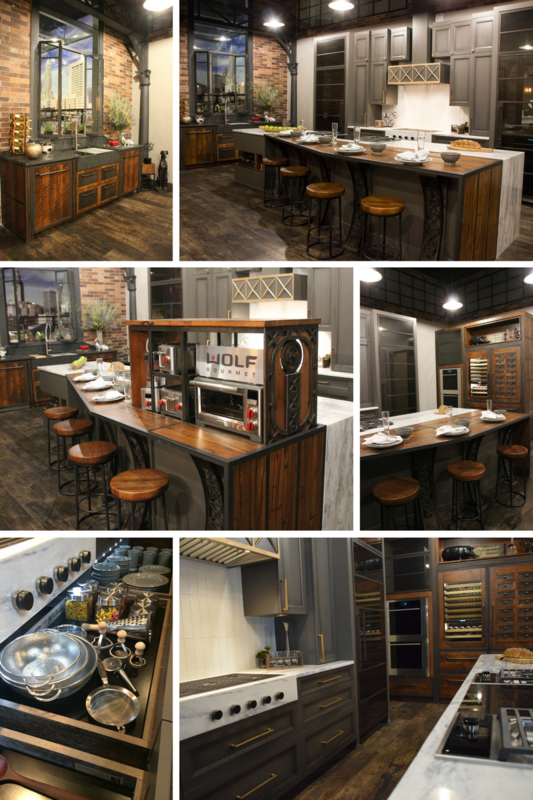 The island also has a pop-up mechanism featuring Wolf countertop appliances. The industrial look is complete with factory inspired columns, beams and windows. The Urban Chic Kitchen combines glamour and function into one space. The sleek white cabinetry pairs with champagne metal accents to seamlessly contain a wall of appliances and fully integrated refrigeration. Calacatta Gold marble, displayed in waterfall fashion, wraps the display cabinetry and also enhances the countertops and range wall. Glancing upward you will notice the beautiful chandelier that is anchored by a custom round deco inspired island. The wine shaft was designed to feel as though you are entering an elevator shaft which was transformed into a wine and spirits room. The entry of the room was inspired by antique freight elevator doors which open up into a space that blends great storage and design. Lighting plays a big role in this small space featuring back lit counters, wine corking table and even a pop-up martini bar fashioned as a martini glass. 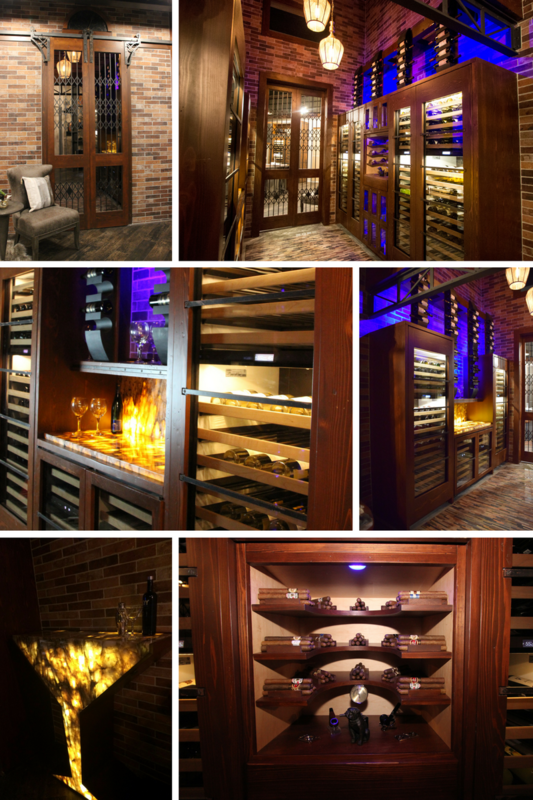 Other unique features of this space include the custom scotch locker display cabinets and humidor. 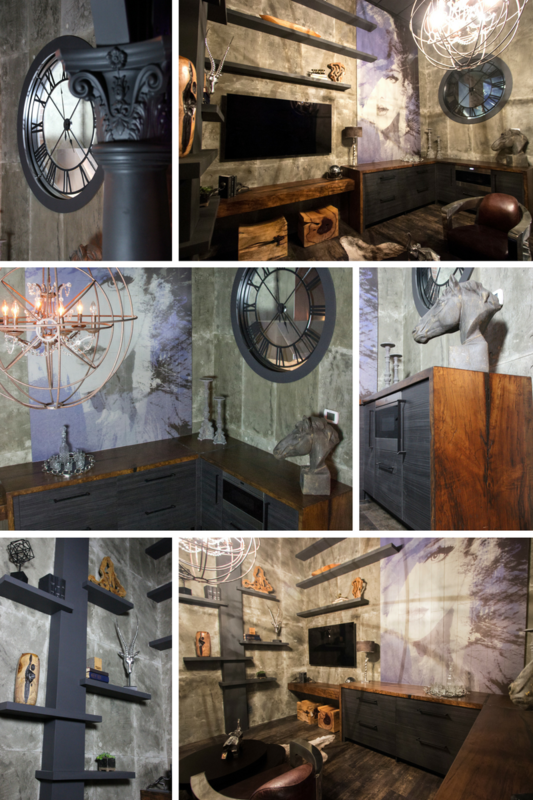 Whether you are tuning in to a game or watching an old movie this multi-functional space features a large work of art flanked with custom concrete wall panels that give this room an industrial look. The integrated appliances are hidden beneath modern, textured laminate cabinetry and finished with a handcrafted, reclaimed maple top. The unique clock window adds interest to this space as well as the large rustic globe chandelier that completes this room’s look and feel. Imagine you are on a trendy rooftop in this space which features everything you will need for an outdoor soiree. Undercounter refrigeration combined with the exceptional performance of outdoor grilling and warming products, including a pizza oven, all make for a great party. This space features views of the Cleveland skyline, metal rooftop railings as well as a custom factory inspired window. The custom cabinetry is styled with porcelain overlays and an exotic leathered granite making this a cool space to hang out. The Galley Kitchen offers the straightforward styling of stainless steel appliances with the modern touches of textured laminate cabinetry. The M Series design styling offers three levels that will fit with any decor. In this particular setting you can choose from the Professional or Transitional series which both work well with the popular Integrated Wine and Refrigeration products. The trendy dimensional tiled wall is highlighted by classic pendant lighting. Be the first to know about new products, projects, or promotions via email.